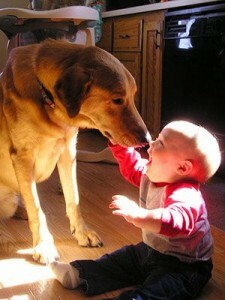 Blog / News So, you think it’s cute when your pooch gives your little one a smooch? It’s no secret that when a child and their dog grow up together, their bond becomes the stuff that movies are made of. So when they share a smooch or two, instead of reacting with disgust, parents and relatives can’t help but to go “Awww!” But is this lackadaisical response a tad inappropriate considering, you know, that we don’t ever really know where our dogs’ mouths have been? When children get gum disease, it’s always much less severe than when an adult gets it. Maybe the gums become inflamed, and maybe they bleed a bit. But it certainly never gets to the point where their teeth are falling out! Yet, in Nebraska, that’s exactly what happened to one young patient—they came down with adult periodontal disease. That was the question that plagued many dental professionals for a time—until they learned of the bond between dog and child. While only 5% of dogs will develop a cavity in their lifetime, most suffer from periodontitis. When a dog exchanges a smooch with an owner, the harmful swap of bacteria ensures. Periodontitis can be just one of many bacteria passed on from canine to human. Unfortunately, periodontitis is the most severe form of gum disease, and results in jaw decay, small pockets between teeth and gums and, eventually, tooth loss. Periodontitis as a result of dog/child bonding can and should be prevented. Cuddling with your pooch is okay, but by all means, make sure your child—and you!—avoid the smooch. It’s save you time, money and stress. Above all, however, it’ll save your child’s smile!